The programmers at Fantasia Film Festival have discovered a lost print of legendary director George Mihalka's 1985 film, THE BLUE MAN (a.k.a. ETERNAL EVIL), deep in the vaults of the CINEMATHÈQUE QUÉBÉCOISE. This could well be the last print available of this film and we are proudly projecting it in glorious 35mm, exclusively for Montreal fans to enjoy. This special presentation will be accompanied by a Q & A with the director himself. A director going through a creative slump, Paul Sharpe is forced to shoot insipid TV commercials just to keep his Montreal-based production company afloat. Dissatisfied of his life both at work and at home, he finds solace in the arms of his mistress, Janus, who introduces him to the world of astral projections, an esoteric practice in which the spirit dissociates itself from the body to freely explore its surroundings. But are these astral journeys really harmless? Not only is Paul’s son convinced that he’s seeing a transparent blue being flying around the house, but people close to Paul are now starting to die one after another while he sleeps. Furthermore, it appears that the victims’ bones and internal organs are literally shredded from the inside. With a cop investigating the string of murders, the noose is tightening around Paul as he comes to realize that this whole ordeal can probably be traced back to a documentary he made a few years earlier. Too few movies are inspired by astral projections. A Montreal director of Hungarian origin who had already hit gold four years earlier with MY BLOODY VALENTINE, George Mihalka returned to horror with a fourth feature that is somewhat unusual, to say the least. 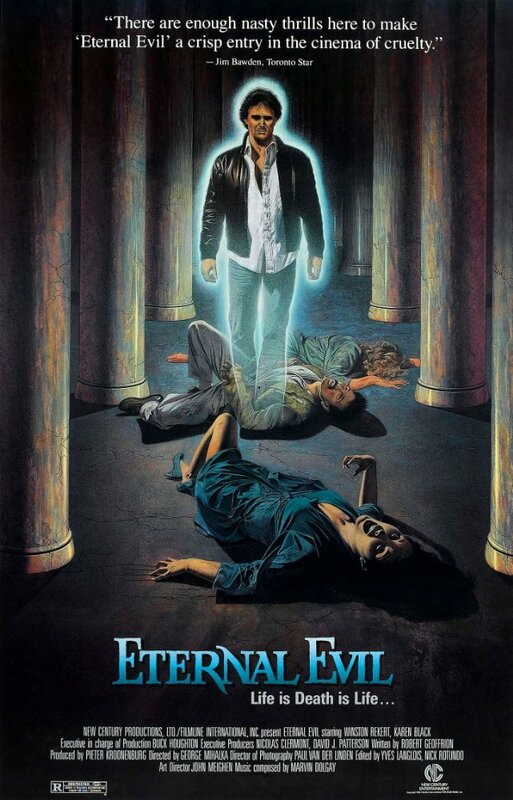 THE BLUE MAN (aka ETERNAL EVIL) somewhat feels a like extended TWILIGHT ZONE or OUTER LIMITS episode scripted by Robert Geoffrion, the writer of the earlier SCANDALE. While THE BLUE MAN was relegated to a limited release during the 1986 holiday season, it received two Genie nominations (Best Actor and Best Music) and won the Prix du public at the Avoriaz horror film festival in January 1987. Director George Mihalka will be present to introduce this rare film to the public. For more information on this screening click here.